Astute observers will notice a new page has been added to the blog. It’s called ‘Promos’. That page has the current listing of all places where you might be able to find a deal on one of my books. There are entries from Smashwords (several of the titles are presently 50% off!) and a few from Instafreebie (several titles are currently free!). If you’ve been holding off purchasing some titles, or else you need a few to complete your libraries, head over there to take a look. You never know. You might be able to pick up the next title in the series at a discounted rate. I’ve also added a Fan Art section to my ‘Art’ page. I recently commissioned one of my nephews for a drawing of an oskorlisk, since the giant serpent was featured in the first Pirates of Perz book. Well, he delivered! I would also like to encourage anyone else who might have more of an artistic background than myself to submit drawings of your favorite character/scene. Not only will it be posted on my Art page, but I’ll also give you a free ebook of your choice (using Smashwords’ coupons). That’s it for now. It’s time to head back to Lentari to see what mischief Captain Flinn has gotten himself into this time. Happy reading! I hope everyone is having a great summer thus far. As many of you will recall, I’ve stated for the record – numerous times – that I’m not fan of the Arizona summer. What do you expect? It can easily hit 120+ during the day and only drop to the mid 90s at night. Oh, we mustn’t forget to factor in the fantastic monsoon seasons which plague the desert. Just a few days ago it looked (& felt) like a horizontal tornado touched down outside. Houses sustained roof damage. Trees were knocked over. Hell, even mailboxes were blown into the street. Be that as it may, I wanted to give you guys an update. As you can probably see from yesterday’s protected post, my latest fantasy novel is in the hands of my Posse. By now, I’m sure they’ve ripped it to shreds. Oh, well. I’ll take whatever help I can get, guys. And for those of you that know me, I really could use the help! 🙂 May the Fang Be With You (Pirates of Perz #1) is slated to be released at the end of the month. I’ve got the preorder in place for Barnes & Noble, Kobo, Apple, and so on. Amazon is a little easier. I can upload the files directly to them and have the book ready for purchase in probably less than four hours. 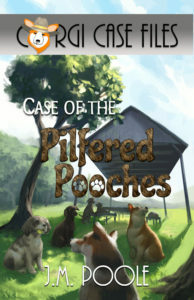 Case of the Pilfered Pooches (Corgi Case Files #4) should be finished by the end of the month, too. That should (knocking on wood) mean that it’ll get a mid August release. 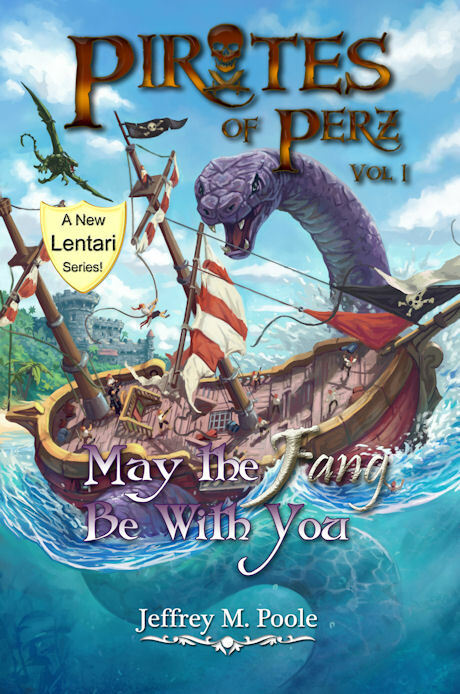 Then it’ll be back to Lentari for me as the second novel of the Pirates of Perz series will be at the plate. Also, I have a Goodreads Giveaway going for Case of the Fleet-Footed Mummy (Corgi Case Files #2). If you haven’t already, jet over there to check it out and sign up! I’d also like to tell everyone that Smashwords is having a month-long sale for those authors who have enrolled their books. Well, I’ve enrolled mine, which means the 9 books I’ve published that has a price tag on it will have dropped in price by 50%. If there’s a title or two you haven’t picked up yet, and have been waiting for the most opportune time to finish your library, now’s the time. Use the “Smashwords” link on the right side, under “Retailers”. The coupon code is “SSW50”. Joe Shawcross, the same gentleman who drew the Close Encounters of the Magical Kind cover, kindly took on the commission to create this one. Once more, I think Joe did a fantastic job. I told him I needed an oskorlisk attacking a pirate ship, with a green dragon in the air and – if possible – a castle in the background. Then we have the cover for my next mystery novel. This one is a tribute to my family’s dogs. My father has three chocolate labs. You’ll see two of them in the background, playing with a rope. My mother has the two cocker spaniels, and of course, I have the red & white corgi. I thought it was a novel way to get everyone’s dogs on the cover of a book. An artist by the name of Felipe, living in Brazil, is responsible for this cover. He also illustrated #2 and #3 as well. Felipe, you’re doing a helluva job! I think that’s it for now. I hope everyone is in the mood to read! I’m gonna be having two releases fairly close to each other. I hope my fantasy fans will give the mystery a try, and I hope the mystery fans will pick up one of my fantasies and give it a try. But, even if they don’t, I am damn proud to be writing books that you’re enjoying. Feel free to look me up on Facebook to say hello! I’ll always take the time to answer any messages that come my way! Meet the Pirates of Perz! Well, it took wayyyy longer than I had hoped, but the first novel in my new Pirates of Perz series has been finished. I’m giving it to my primary proofer (my wife!) as soon as she returns from her business trip. Once she goes through it, it’ll then be given to my Posse. Flinn – one pompous, over-confident captain with a very surprising jhorun. Rusty – quartermaster. Always seem to know where to find the treasure. Von – pirate with an indefatigable sense of direction. Would much rather be anywhere else than here. Jino – a vicious fighter with an inferiority complex. Casimir – brings out the fear in everybody. Pedr – lowly cabin boy. There you have it. That’s the crew of the Emberbrand. Quite possibly the most notorious pirate ship of the Seven Kingdoms. If only they would have stayed retired, then they would have stayed out of trouble. As it is, they’re looking for an all-powerful stone. Guess where they think it is? Yep! In everyone’s favorite magical kingdom… Lentari! Now, with that out of the way, guess what? It’s time to return to Pomme Valley for a spell. A rash of dognappings has been happening, and its up to Sherlock and Watson to figure out who is responsible, and poor Zack to decipher the clues he’s been given! As always, it’s chock full of humor, corgi antics, and colorful relatable characters living in a small southwestern Oregon town. I’ll keep you posted on its progress! Anyone see any good movies lately? My wife and I saw Guardians of the Galaxy, Vol. 2 last week. Well, did we like it? Hmm. I do think there was more humor and more fun in the first. I’m not really sure what the point was to the second movie, nor how it was supposed to fit into the Marvel “master plan” they are always touting. I guess time will tell. The first Guardians got a solid A. The second Guardians gets a B-. Maybe you guys liked it a little bit better. Starting tomorrow, there’s a new Goodreads giveaway happening for one of the mystery novels. Case of the Fleet-Footed Mummy (Corgi Case Files #2) is up for grabs for residents of the US, UK, Canada, Ireland, Germany, France, Spain, Sweden, and Australia. I think that’s all of them. Anyway, the giveaway goes live at midnight tonight! It’ll run from the first of June all the way through the end of July. Good luck! I hope everyone enters! Giveaway ends August 01, 2017. I think that’s it for now. Stay tuned! I will be posting the completed cover for Pirates of Perz #1 shortly! Two Books at the Same Time? Yep. I’m currently working on 2 books at the same time. Those would be books #13 & #14. I’ve had numerous people ask about the 7th Tales of Lentari novel. What I can tell you instead is that there’s a brand new Lentari series starting up. It’s going to be a trilogy. If you want to get technical, it could be called Tales of Lentari #7, but instead, it’ll be Pirates of Perz #1. May the Fang Be With You (Pirates of Perz #1). It’s the 10th novel set in Lentari. Case of the Pilfered Pooches (Corgi Case Files #4). For those of you who enjoy mystery novels, feel free to return to Pomme Valley for a spell! Both books should be written by the end of the month. I already have the cover made for Pirates of Perz #1. I’ll contact my artist in Brazil (for the mystery novels) in a few weeks so he can get started on that cover. It’s going to be a great month! Stay tuned! Oh, I’m also thinking about starting up some Goodreads Giveaways again. Which book should I put out there? You can vote for your favorites below. Be sure to include which title you’re interested in AND which country you’re in so I can be sure they’re included! In this corner, one of the largest companies that currently exists: Amazon. In the opposite corner? Me. For those of you who may not know, I had to do battle with Amazon since they yanked my books and cancelled my author account. If you’re curious enough to be here ’cause you’re wondering just what the hell happened, let me sum it up, in case you don’t want to read the War & Peace novel that ensues. Then, if you’re still interested, read on, as I go into specifics. The summary: Amazon sent me an email Tuesday of this week at 5pm, only it landed in my Junk mail folder. I didn’t see it until around 10pm that night. They (Amazon) accused me of creating bogus accounts to boost page reads of Case of the One-Eyed Tiger (CCF#1). They say it’s against their rules. As a result, my KDP account was officially terminated and they inform me that all my books will be removed, which they were the following day by 5pm. Now, bear in mind that I don’t know a damn thing about any “bogus accounts”. I’m completely in the dark. In a panic, I start writing emails, including sending one to Amazon’s bigwigs, and essentially prove to them that I have no knowledge of any bogus accounts and certainly didn’t create any. Today (Thursday), I get the email from Amazon stating my account is reinstated. My books reappear by 5pm. Ok, that’s the short version. Here’s the long version, in the order in which it happened to me. 1/24/17. 10pm. I’m skimming through my Junk emails and notice a message from “title-submissions@amazon.com”, specifically from a “Katy C.” and is dated from earlier in the day, from around 5pm. The actual email is here. They (Amazon) accused me of creating “systematic accounts” and using them to boost the page reads to manipulate the Kindle Unlimited platform. 1/24/17. 10:01pm. Hoping this is just a phishing email, I immediately head to kdp.amazon.com to log into my account. Unable to do so. Have minor cardiac episode. Am desperately hoping this is some type of sick joke. I'm at a loss as to what you're referring to. Are you insinuating that someone has hacked my KDP account? I've been a self-published indie author since 2010. I published my first novel with Amazon on that year and have since released a total of 12 novels. I have never had a problem with anything there. I can only assume someone is trying to hack my account. I have since called Amazon Customer Service and they walked me through changing my password. However, I am still unable to log into my KDP account. Could I get someone to call me at (***) ***-**** to discuss this? I'm in the dark as much as you are with regards to this situation. 1/25/17. 6:00am. Still unable to log into my KDP account. Verified books are all still on Amazon. Again, am hoping this is some sick, twisted prank. No response from Amazon as of yet. Thank you for your email concerning the status of your account. Systematic accounts are those that facilitate illegitimate reading or borrow activity. You're welcome to promote your book through third-party websites and other services, but you are also responsible for ensuring that no tactics used to promote your book manipulate the Kindle platform and/or Kindle programs. In order to help us evaluate your appeal, please provide any information about promotional or marketing service you might have used. 1/25/17. 4:45pm. I noticed that every title I had released in the Kindle store was now missing. The only books Amazon had of mine were my paperbacks, and I wasn’t convinced they wouldn’t mess with my Createspace account, either. My day seriously started spiraling straight back to UberPissedVille, with a layover at DepressedTowne. 1/25/17. 5:35pm. I check for email. I get the message from above, stating I needed to provide them info about what marketing services I’ve used. I fired off a response to John, explaining everything I’ve done with regards to that book, which is to say, not much. The only promotional services I’ve used is theirs (Amazon’s) and a few FB ads. But, since the FB ads were so-so, I stopped using them around 3 months ago. 1/25/17. 8:27pm. In a fit of desperation, I look up corporate contact numbers for Amazon. Phone numbers, email addresses, anything! And then I find this page, talking about how Amazon founder Jeff Bezos has gone on record, imploring people to contact him should there be a problem with anything Amazon related. And it listed his personal e-mail addy. 1/25/17. 8:28pm. I pen an email to Mr. Jeff Bezos, Amazon CEO Founder. Unfortunately, we need some more time to look into the matter. We are sorry for the delay and for any inconvenience it may cause you. We will be in touch within five business days. 1/25/17. 10:06pm. Now I’m freaking out. I was starting to feel like I was royally Fubar’d. What was I going to do? I knew that if I could talk to a human then I could convince them that they’ve made a mistake. However, I only had an email addy. And the founder’s email addy. So… why would a billionaire read/respond to my email? I was certain Amazon just wanted to sweep me under a rug somewhere and be done with me. 5 business days for some type of resolution? Surely someone else must have gone through this hell. I’m now researching this situation on Google. I couldn’t be the only person that has ever fallen on the wrong side of ye almighty Amazon. What I find, however, isn’t promising. Those that have had their KDP accounts terminated don’t get them back. Or, the very select few that I found that did, have said that it takes weeks, even months, to get the account back in good standing. Everyone says the same thing. Lack of a customer service number is disparaging as hell. The only communication is through email. In the pit of my stomach, I knew Amazon wasn’t going to reinstate my account. Not without a fight. 1/26/17. 12:40pm. That’s when this email arrives. I read it and let out a whoop. My KDP account was being reinstated! To verify, I immediately went to kdp.amazon.com to see if I could log in. I could! I checked the Kindle store. Nope, the books were gone. Still. At least I had hope that they’d be back shortly. So, did this mean that my midnight email to Amazon’s CEO made it to him?? This seemed waayyyyy too quick of a resolution. Whatever. I wasn’t complaining. 1/26/17. 2:49pm. My cell phone rings, with a 206 area code showing on the display. I used to live in Washington state. I happen to know 206 is the area code for Seattle. Home of Amazon. This was a call I was more than willing to take. The person on the phone – and I missed his name – was a guy who identified himself as a member of the KDP Executive Service Team. He wanted to know if I had received the email, stating that my account had been reactivated. I told him that I had, and that I had also noticed all my books were back. He said that was good to hear, and then he made a discernible effort to see how I was doing. That took him by surprise. He then went on to say that, after reviewing my account, and all my years of history with them, that they would have reinstated my account without any problems, and there was no need… and this is my favorite part – to “have written Jeff about this“. I told him that I wasn’t sorry, and that you have to understand my point of view. There was no warning. There was no… “hey, if you do this again, we’re going to terminate your account”. I told the executive CSR that they should consider simply telling the author that they would be kicked out of KU, not terminate their account without any way of contacting this infamous “title-submissions@amazon.com” team that seems to hold the power of God at KDP. He understood. He finished the call by asking me to be careful with the KU program, because there are many automated algorithms out there that are continually trying to sniff out illegitimate accounts and to keep their authors safe. I told him that I wouldn’t ever use KU again and that I was planning on pulling CCF1 out of KU just as soon as I could, which would be in a couple of weeks. He then volunteered to pull it out for me, which I instantly took him up on. Just as soon as I hung up the phone, I was logging into Smashwords and submitting all my files so that I could release the title wide. Not only did Smashwords convert the file in record time, but I also took a screencap of the conversion and posted it in FB, thanking Mark Coker. Now, FB instantly linked the “Mark Coker” to his actual FB page, and wouldn’t you know it, Mark instantly Liked the comment. I went back to my Smashwords account to see for myself that people were already downloading it when I noticed that it had already been approved for the Premium Catalog. Anyone familiar with Smashwords will know that it can take a day or two. We’re talking less than 2 minutes. Tops. Mark had to have a hand in that, which he admitted that he did. Mark, if you ever read this, thanks again, buddy. So… I get to end this day knowing that a rich billionaire founder of one of the biggest companies out there read my letter, asking for my account to be reinstated, and the founder/owner of Smashwords did me a solid favor by getting my book fast tracked for premium acceptance. As I write this, I see that Case of the One-Eyed Tiger (Corgi Case Files #1) has already appeared for iBooks. In an effort to kick start the series, I’ve made this book free of charge. For the time being, anyway. Hey, everyone! I hope everyone is enjoying the new year thus far. Any significant plans? As for me, I’m stepping up my schedule. I’m going to try and – get this – write my fantasy novels in 2 months and the mysteries in 1. If I can keep to that schedule then that means I’ll be able to release 8 books in a single year. Think I can do it? I also have the titles of the next four Corgi Case Files. I’ll give you a teaser. The first mystery of the year, due to be written in March, will be entitled Case of the Pilfered Pooch. So, to start this year off, I’m holding a giveaway for one of the mystery books. Which one? Well, whichever the winner would like. Would you like to enter? There’s only one prereq. A review. Comment below and leave me a link to the review you’ve written (for one of the mystery books) and you’re entered! I’ll have Keeley pick a winner at the end of the month. And, for the record, it doesn’t matter where you’re at. This contest is open to everyone, regardless where they live. And has left a review for one of the mysteries. If there’s only one person who enters, well, then that person is going to get a signed print copy of any of the three mysteries. Good luck to all who enter! Dec 18, 2016 - General, Indie Authors, News, Updates Comments Off on Anyone up for a Christmas mystery? Anyone up for a Christmas mystery? 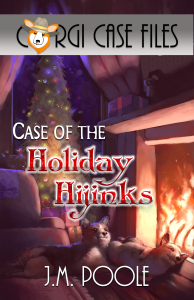 I’m very pleased to be able to announce that my latest novel, Case of the Holiday Hijinks (Corgi Case Files #3) has been finished and is in the hands of my Posse. But wait, you say. Didn’t you just release a new mystery? 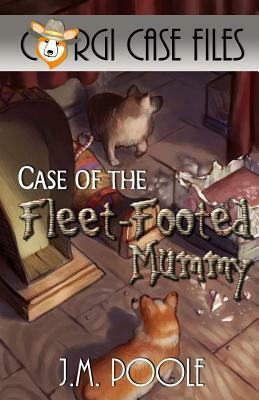 Case of the Fleet-Footed Mummy (Corgi Case Files #2) was released less than two weeks ago. However, I had started on my next mystery the instant I was finished with #2. I really wanted to write a themed story and release it on the corresponding holiday. I tried for the mummy novel and Halloween, but I didn’t make it. This time, I vowed I’d get Holiday Hinjinks released before Christmas. There’s a Grinch in Pomme Valley! Someone is stealing presents right from under the noses of unsuspecting home owners. How is he sneaking in? Why is he only taking the presents and ignoring other valuables? Corgis Sherlock & Watson are on the case! Accompanied by their reluctant human Zack, the unlikely trio must find out who’s responsible for the thefts and stop him before anyone gets hurt. Nervous officials, scared townspeople, and impending visits from visiting family members. Will Zack and the dogs be able to solve this case before he has to explain to his mother why the local police department have him on speed dial? I’ll post an announcement when it goes live. I’m thinking by Thursday if I’m lucky, or Friday at the latest. That’s 2 days before Christmas! I hope all of you enjoy the story! Stay tuned! I’ve got one massively busy production schedule lined up for 2017! Dec 17, 2016 - General, Indie Authors, News, Private, Updates Comments Off on Protected: Holiday Hijinks!